Synopsis: Two best friends are filming a comedy about getting revenge on the bullies at their high school. One of them isn’t joking. My Quick Review: I have to admit, I feel kind of cheated by The Dirties. The whole movie teases you of a big impending doom that never completely comes and, as such, the ending is a big letdown. 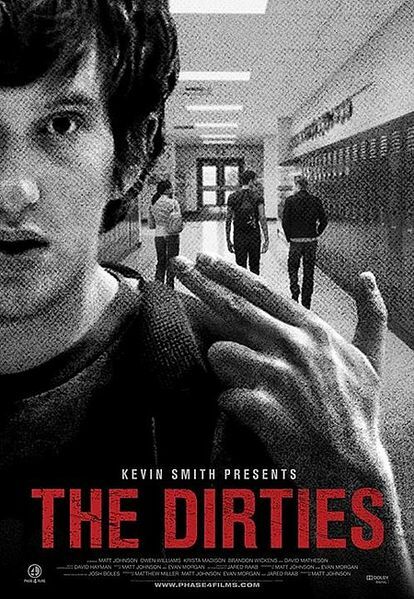 The Dirties takes a found footage approach to tell this classic story of High School Bullying. The use of POV shots is justified by the movie within the movie trick and, it kinda work at the beginning but, as the film moves on, you’re just wondering about the mute cameramen and why they are always there shooting. Both main characters are immediately sympathetic and the dialog never feels forced. It’s therefore very easy to connect with and get attached to them. The tension slowly rises when it becomes obvious than one of the duo is getting more serious about filming an actual shooting and his sense of reality starts to blur away. The problem with The Dirties is that this creates a lot of buildup but not much reward in the end and therefore, seems pointless. So, while The Dirties has 2 main leads with great chemistry and a skillful blend of dark humor and dread, it ultimately fails to deliver anything new or original to the genre . Skip it if you’re looking for something grittier and with more horror/violence. Click Here to Watch The Dirties Online Now!